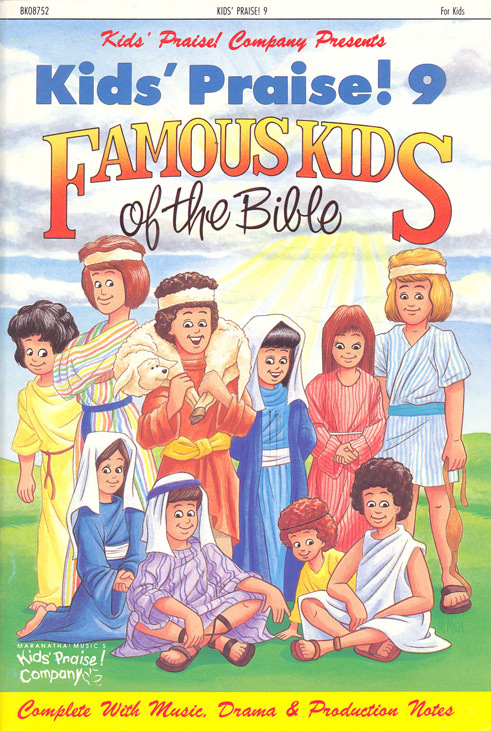 Famous Kids of the Bible : Kathie Hill Music, LLC, Making music with and for kids for over 25 years! Sing about Samuel, David & Jonathon, Rhoda, Jairus’ daughter, Namaan’s servant and 'no name' kids in the Bible! Follow "Zack" to meet Bible kids who set examples for us to follow and show the importance God places on children. This play-within-a-play first released in 1991 was the last Kid’s Praise musical from the publisher of the Psalty & Colby the Computer musicals. Tapping Kathie Hill to write the script and co-write songs with arranger, Clifford "Barney" Robertson, they produced a creative approach to presenting David, Jonathon, Samuel, Rhoda, Jairus’ daughter, Namaan’s servant and other 'no name' kids who spring from their adult. A clever script, great songs and "mini-me" or puppeteer Zacchaeus leads the large cast that make this an all-church or all-school production. Kathie's Note: This is not a musical for a first time director, but if you need a work with lots of parts for a broad age range this is it! The clever script is challenging, but a sharp actor or puppeteer as the Zack character can ad-lib to hold any loose ends together and in turn produce much laughter and focus on the important Biblical lessons. Simple set, staging and instructions for a 'dorf' or 'mini-me' character are outlined in the production notes included in the choral book and combined with great songs & lots of kid parts make this musical a crowd-pleaser – and a heart warmer! Licensed Digital CD (3x) files with spilt left channel instrumentation/right channel choral vocals and stereo instrumentation only. (No dialogue or solos.). SALE PRICED Review READ-ME.txt file contained in the zipped download for instructions about BIN/CUE use. Accompaniment CD - Famous Kids of the Bible - SALE PRICED! Split track CD contains the orchestral accompaniment in a split-track version with choral vocals on one channel and instruments on the other. As this CD is used for performance, no solos or dialogue is included. Downloadable PDF of all songs (leadline & chords), script and production notes with permission to make 3 copies . Additional copies require purchase of additional 3x license/s. Sleeved CD of full musical, songs & dialogue.